You may never have a problem with your wisdom teeth (or never develop any at all) and yet still be familiar with how commonly they can lead to oral health trouble. Unfortunately, many people do experience such trouble, and their knowledge of it is first-hand. At our Lafayette, LA, dental office, we commonly perform wisdom tooth extraction to remove the impacted molars and alleviate the discomfort associated with them. We also help you get to know your wisdom teeth better, and recognize when extracting them may be a good idea even if you haven’t yet experienced any issues. Wisdom teeth is the common name for your third set of permanent molars, which typically begin to erupt around the ages of 17-25. Historically, our ancestors required these four additional teeth to properly bite and chew a much rougher diet than we’re used to now. These days, the typical adult human mouth comfortably accommodates all of your teeth up to the second set of molars, leaving little room for the third. When they do develop and try to erupt, the wisdom teeth can often become stuck and impeded by the molars already present. When a third molar gets stuck behind a second one, the impedance doesn’t stop it from trying to erupt anyway. The wisdom tooth will continue pushing and trying to force its way through, which can force the second molar (and the teeth close to it) out of alignment. It can also damage your teeth and the jawbone structure surrounding them, causing sometimes severe levels of discomfort and increasingly worse oral health problems. The longer an impacted wisdom tooth is left unaddressed, the more damage it can cause, which is why extracting them promptly is important to your long-term oral health. 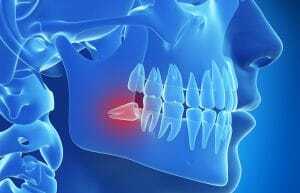 Removing an impacted wisdom tooth is the only way to stop it from causing continuing damage to your smile. Because of its obstruction, the extraction procedure may involve minor oral surgery to expose to the molar’s entire structure. Once the impacted tooth is removed, we can treat any issues that may have resulted from the impaction, including damaged tooth structure, tooth misalignment, and more. However, you will not have to replace a wisdom tooth after it’s been extracted. Wisdom teeth can be a common problem for many people, but by keeping a close eye on your oral health, we can advise you when it may be time to extract them. To learn more, or to schedule a consultation, call the office of Michael J. Young, DDS, in Lafayette, LA, at 337-237-6453. We proudly serve patients who live in Breaux Bridge, Broussard, Scott, Youngsville, and all surrounding communities.